This is the classic question, asked by anyone responsible for determining the value of business programs and assessing budget. But when it comes to content, the right answers still elude many marketers. Half of executives admit their data-driven marketing efforts are lagging or siloed, and another 22% report their data-driven marketing efforts are virtually non-existent, according to a Forbes Insights’ report. You need to connect content to revenue. We put together a free collection of templates to help you build a complete marketing metrics dashboard. But for this post, we take a deep dive into how to actually calculate marketing impact on revenue. We used a reverse-engineered funnel approach to project revenue goals for sales and marketing teams and to map content to these goals. First, let’s cover some ground rules. There is no “easy” button. There are no shortcuts to managing and leveraging data analytics and insights. Because a single content asset can be used by different teams at different points in the sales cycle, it’s important to have a solid cross-functional and integrated tech stack to ensure that you’re getting good data. If you don’t trust your data sources, you’re unlikely to benefit from their insights. Sales and marketing are both accountable for revenue. To connect content to revenue, your marketing and sales teams need to be tightly aligned to the same business objectives, company messaging, and agreed-upon processes. Because so much of the buyer’s journey is self-service and digital, it’s critical that marketing and sales messaging stays in sync. Otherwise, the hand-off from marketing to sales, for example, from marketing-qualified lead (MQL) to sales-accepted lead (SAL) to opportunity (OPP), will feel disjointed and leave your prospect feeling confused. By establishing revenue goals first, marketing and sales can work together to determine what percent of revenue the marketing team must contribute on an annual and quarterly basis. 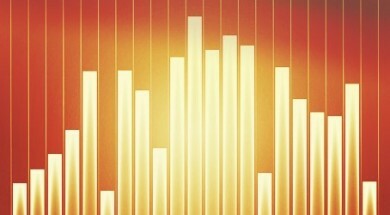 Work backward from these goals to calculate volume at every stage of your marketing and sales funnel. These stages are different from company to company, but common examples are opportunities, MQLs, and net new leads. Keep in mind that marketing is nurturing and preparing leads for the sales team, so you’ll want to factor in the average length of a sales cycle to determine how far in advance marketing needs to deliver opportunities to sales. For example, if the company has an average deal cycle of 90 days, marketing needs to deliver enough opportunities 90 days (one quarter) in advance of the expected closed-won deal. Use this basic formula to calculate needed marketing-driven revenue based on overall business growth goals – total revenue multiplied by percent of marketing ownership equals marketing revenue contribution. Next, calculate how many closed-won deals marketing needs to generate for the next sales cycle to meet marketing’s revenue contribution number – marketing revenue owned divided by average deal size equals number of marketing-generated closed-won deals. 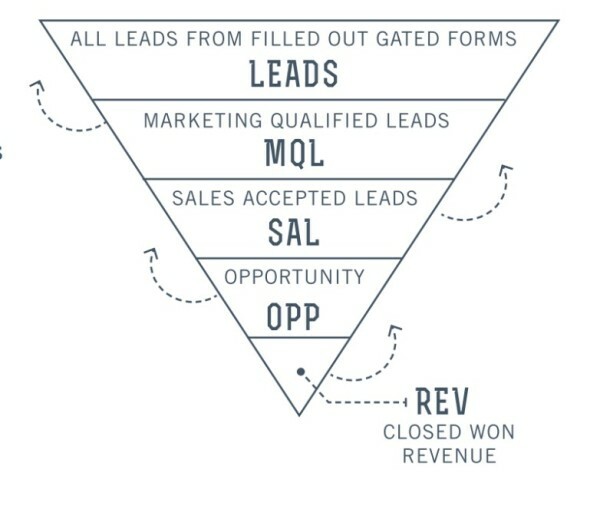 Finally, decide on a conversion model to determine the conversion rate needed between each stage of the funnel (ex: lead to MQL, MQL to SAL, SAL to OPP, OPP to REV) – number of leads from current stage divided by conversion rate of previous stage to current stage equals number of leads needed at previous stage. These numbers serve as a benchmark when calculating the return on investment for individual content assets. Once you’ve established baseline goals that have been agreed upon by both sales and marketing leaders, you can map your content to those goals. Now that you have baseline success metrics established, you can understand how individual content assets support pipeline velocity. To frame content within the pipeline model, map your marketing programs at each stage. 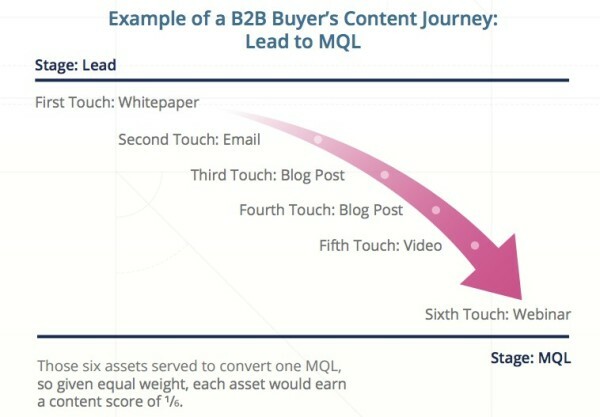 This helps you understand what types of content to leverage at each stage to meet your conversion goals. In the example above, we have outlined the programs we want to execute to drive conversions (from leads to marketing-qualified leads) at the awareness and investigation stages. Based on the number of MQLs needed and historical performance data, assign a value to each program. Now that you’ve mapped your program and content to goals, you can dig into individual assets. Engagement metrics such as “likes,” clicks, shares, and downloads give marketers valuable insights into the types of content topics and formats resonating by channel. However, to tie content to actual revenue, you have to apply a scoring model. The most common way to determine the content score of any asset, campaign, or category of content – specific topics, themes, or formats – is to evaluate each buyer’s movement through a stage of the pipeline and the content consumed during that stage. You also can apply a first-touch/last-touch weight-attribution model, but for these purposes use an equal distribution model. To get an accurate picture of how an individual piece of content performs at each stage of the buyer’s journey, perform this operation across all buyers at each stage based on individual buyer journeys, and then sort by individual asset, campaign, and category. 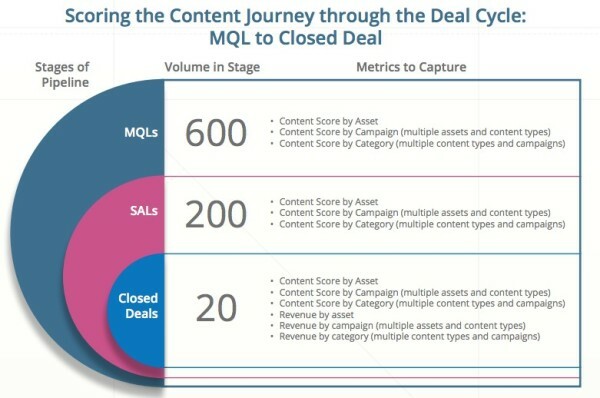 Using this framework to set revenue and conversion goals by team and by implementing the content scoring model, you can connect content to revenue. Calculating content ROI manually is tedious but absolutely necessary for positioning your marketing team as a critical department that drives revenue. Your content matters – now go prove it. Erica is a Content Marketing Manager at Kapost. Equal parts creative and strategic, she manages the Kapost blog, co-authored the B2B Marketing Playbook, and most recently published original research on the B2B customer experience. Get in touch @EricaLindberg_.